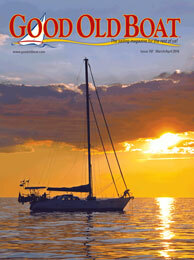 Grampian 26 ⛵ "Worlds Largest 26 Footer" : Customer Service of Good Old Boat Magazine.. 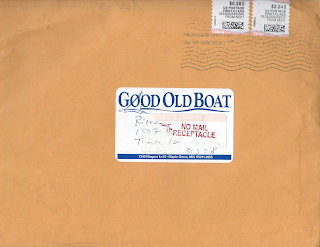 I had submitted an online request for a free issue of the very popular Good Old Boat magazine, and received the January/February 2016 edition in the mail soon after. You can view 6 pages from the issue in their "sneak peek"
When the full edition hard copy arrived in the mail, I was impressed with the quality of not only the content of the articles and stories, but also of the print job itself. I have a lot of familiarity with the what work goes into publications, the types of print jobs, and cost involved, and can tell this issue hadn't been just thrown together, and they didn't take the more budget printing route, which saves on cost, but shows in the final product. They put out a first rate publication. So I ordered a years subscription, and also requested a hard copy of the March/April 2009 back issue which contains a review on the Grampian 26. The website indicates that issue to be only available in a pdf downloadable version, but fortunately Karen Larson said she had a few copies left and just happened to have one of them right there laying on her desk! - So I lucked out.. It was in the first week of January when she mailed me the back issue, but a few later I received an email from her..
"The issue I mailed you just came back with stickers saying: NO MAIL RECEPTACLE and Return to Sender - No mail Receptacle - Unable to Forward and other nasty USPS talk. Now what?.." Evidently I had mistakenly told her the address of a little store front I lease on the main road, which does not have any mail delivery, so the post office returned to sender. I can be such an idiot at times. So I emailed her my correct mailing address and she responded immediately .. "..I sent your envelope out again. We shall see!.." Now the middle of February, it still had not arrived, so I emailed to make sure she had mailed it to the corrected address that I had provided..
"Yes, I did send that. I don’t keep track of the dates. Why not give it until Monday? If it hasn’t arrived by then I’ll send another one.."
Come Monday, I received another email from Karen..
"I’m ready to send a second issue tomorrow, Rich, if you haven’t received my package in today’s mail. Let me know!.." I hadn't... but just in case I gave it another day, and then replied that there had been no sign of it..
She replied in short order..
Is there another mailing address I can use? 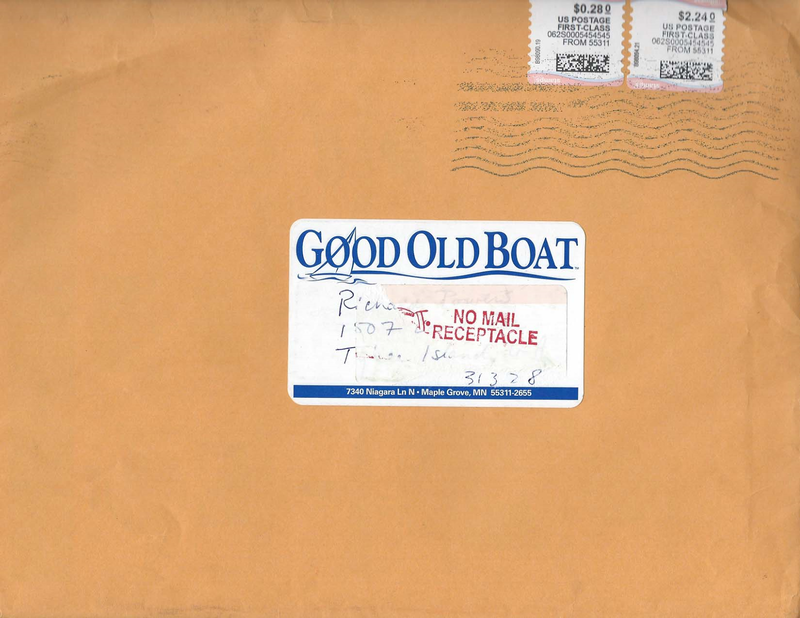 This is one very well-traveled envelope!" Unbelievable!!. I replied; Karen, there's got be something wrong somewhere. Before I call the post office, can you confirm the address?.. "..I was able to tear a bit of the sticker off the label (thanks, USPS). Yes. Address is confirmed.. ..The envelope seems OK. Not confusing. No barcodes at the bottom that might have been for the previous address. Tell you what: I’ll scan it..."
"Karen, I took a print of the label to the post office, and they said they wasn't sure what happened but said that the 1507 looks kind of like an 1807 and maybe that's why since there is no such address.. They said if you resend it to make sure the address is clear, and that they would keep an eye out for it and make sure I got it.. ! I know this has got to have become a pain the A to you by now, but would you please send it yet again?? "..I’ll do it again. But my 5 was not an 8! (The USPS sticker on it kind of makes it look that way). Unfortunately I’ll cover it with a new label and you won’t know that for a fact. Seems like something in the cards must be trying to keep me from reading this article, it's going to tell me something terrible about the Grampian 26 that I was unaware of.. or maybe it's a blessing creating a prolonged anticipation and thus making the final reading all the more better.. or maybe someone at the post office is jealous of my boat, so they're intentionally sending it back out of spite.. or maybe I should told you the correct address to begin with. Actually this ordeal feels very much like the frustrating delay I experienced in not only getting the Grampian transported down here after I had bought her, but also the delays in having it registered, but it all came out well in the end, as should this..
Who knows, I actually may eventually receive the new cushion covers I was that was supposed to have been included with the sale months ago, but I'm not holding my breath. Anyway, looking forward to the issue. I know you'll be glad to be done with this. They say three times the charm. sigh.. They also say three times you're out.